With an impressive performance three-phase performance, the Bears came back for a win over the Eagles in Philadelphia on Monday night. 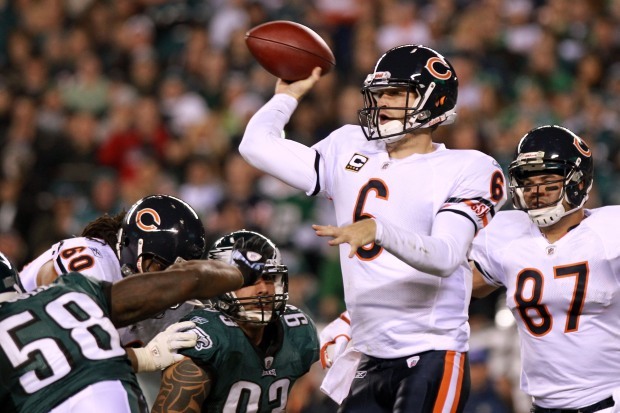 Aided by the return of Earl Bennett, Cutler threw two touchdowns and was not sacked. The Bears started the game right, with a 12-play drive that ended in a Cutler-to-Matt Spaeth TD pass. After each team scored a field goal, Matt Forte's usually rare fumble was returned for an Eagles touchdown. Philadelphia had the momemtum, until DeSean Jackson fumbled a punt return and the Bears capitalized with a touchdown. The Eagles scored twice in the third, but the Bears came roaring back late in the game, with two field goals and an Earl Bennett touchdown. Next, the Lions will come to Soldier Field for a game that will be pivotal in the Bears chances at the playoffs.